heather & olive: crafty Christmas. Don't worry, this is my last Christmas post. And no, there will be no photos of my familial celebrations because I took zero pictures (hence, the need for me to take a photography class and learn how to use my camera in order to capture memories and share them with the world wide web). Months and months ago, my mom's side of the family decided that 2013 would be the year of the crafty Christmas. I have zero skills when it comes to traditional crafting: the only think I know how to do is cook, so I put my pots and pans to use. Preheat oven to 350. Toast the chopped pecans on a baking sheet in the oven for 6 to 8 minutes, or until fragrant. Melt the chocolate according to instructions on the side of package. Spread melted chocolate over the cooled toffee, and sprinkle with the pecans, pressing lightly to set pecans into chocolate. Let set at room temperature 1 hour, or until the chocolate is set. Break toffee into pieces. The first batch I made was a total disaster--I relied on my candy thermometer, and holding that in the mixture plus stirring vigorously didn't work for me. I burned the crap out of my toffee and the pan, and it went into the trash. For the 2nd and 3rd batch, I relied solely on the color of the toffee and when I thought it looked ready, I removed it from the heat and poured it into the pan to set. It worked perfectly. I then packaged it in mason jars with these labels. And my tasty, crafty Christmas was complete! 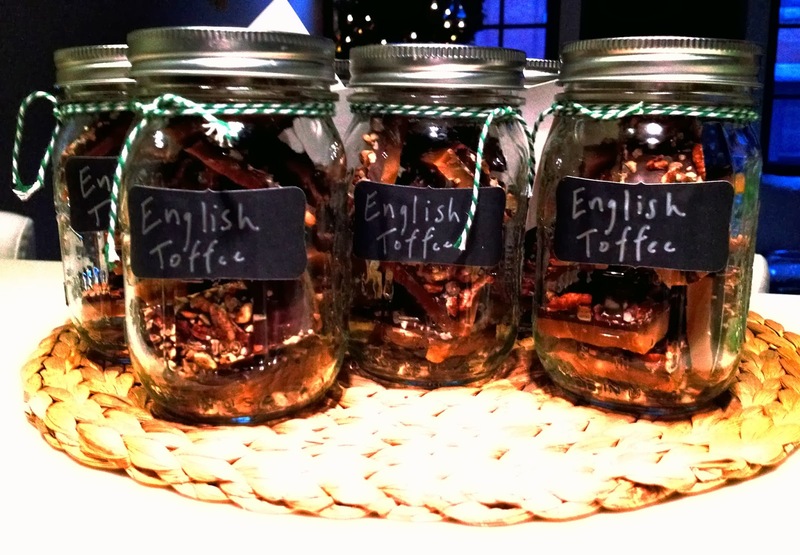 I would make this again, but I must admit that stirring the toffee and watching it so closely is a total pain.